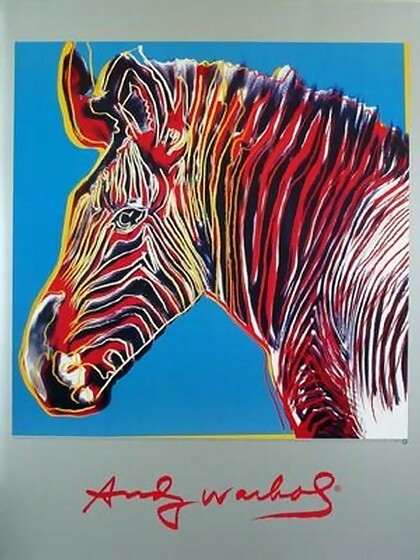 STUNNING ANDY WARHOL OFFICIAL LIMITED EDITION ENDANGERED WILDLIFE ZEBRA!, This is a wonderful exciting SPECIAL EDITION Lithograph Print Created by Artist Andy Warhol. It is the authorized portrait of wildlife endangered species. Features gorgeous deep rich color tones in this print, excellent! Facsimile plate signed. Made of the very Finest Archival Museum quality Paper and in excellent NEW MINT CONDITION is Highly desirable for collectors. Approved and Authorized by the Andy Warhol Foundation Limited Edition. This item selling in Upscale Art Galleries and Museum galleries if it can be found. This is a very large Print reproduction, perfect for any elegant home, office, restaurant or place of business. WE CARRY OVER 200 ANDY WARHOL Art works in our inventory including Limited Edition Prints and Signed Serigraphs and Lithographs. Click the button below to add the Fab Andy Warhol Official Rare ENDANGERED Species Wildlife Zebra Litho Art Print to your wish list.